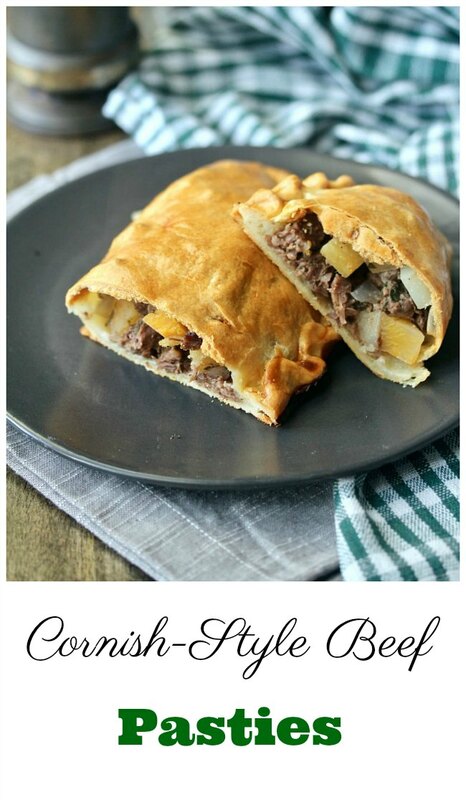 Pasties actually have Protected Geographical Indication (PGI) status in Europe, so I don't want to actually call these Cornish Pasties, lest the UK food police come after me, but I think this recipe is pretty true to the traditional pasty. This was also the first time I've ever tried or cooked rutabagas. They are pretty wonderful! When I first looked for them in the grocery store, I couldn't find them, so I bought a turnip to substitute. When I got home, I looked them up, and realized that the rutabagas were sitting right next to the turnips, but were marked parsnips, which I've never cooked with either. I'm pretty sure the turnip would have been fine, but, because I'm obsessed, I immediately went back to the store and picked up a rutabaga. Now I own a turnip (which I've never cooked with either) to figure out how to prepare. I welcome any ideas! 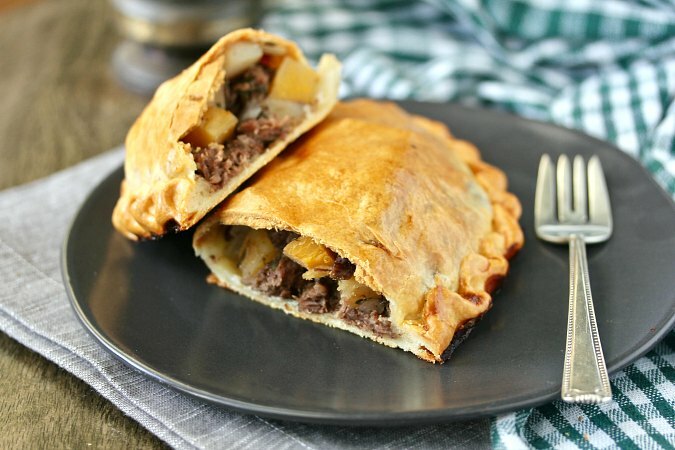 The pasty (rhymes with nasty), with the emigration of Cornish miners, also took hold in various pockets of the world, including northern Michigan and the state of Hidalgo in Mexico. In fact, the one pasty shop in my area was started by a Michigan native and is now run by two men from Hidalgo, Mexico. 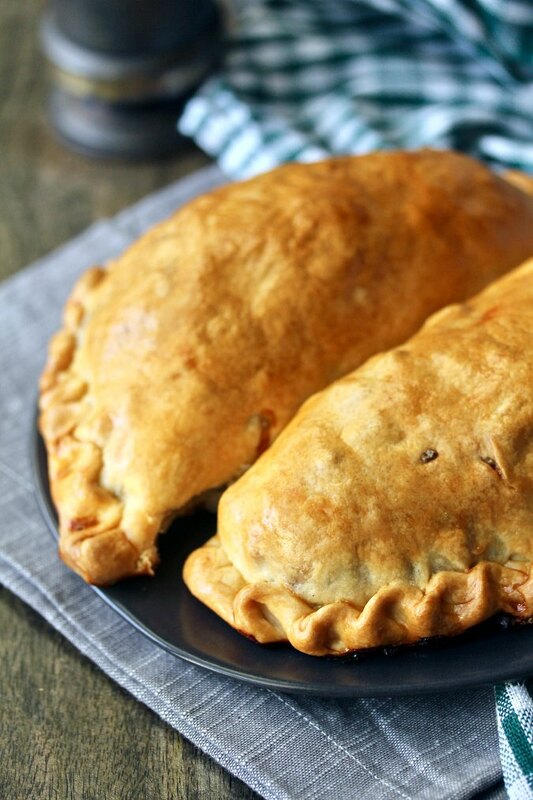 Pasties resemble empenadas, but, unlike empenadas, the filling is not cooked before being folded into the dough. In addition, the pastry for a pasty is firm and elastic rather than light and flaky. It's supposed to be strong to hold in all of the ingredients so that a miner can hold and eat one with one hand. One theory is that the dough is firm to protect the filling from the toxins on the gloves and hands of the miners. Fortunately, you don't have to worry about that and get to eat the delicious pastry with the crust, a wonderful flavor combination. 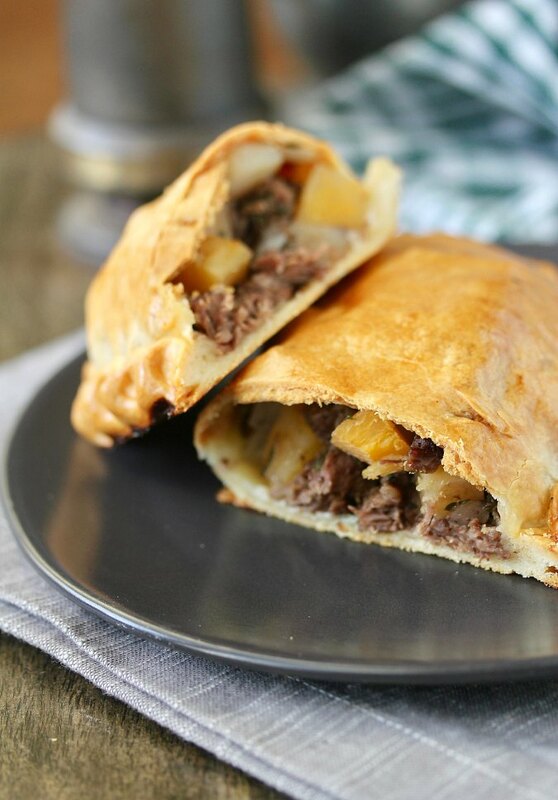 What makes this pasty dough different? This dough is unusual in that it is kneaded like bread dough to make it strong and elastic. You can roll it out and stretch it over the filling without having to treat it gently. In addition, the dough is easy to press together on the edges. If you make a mistake while assembling the pasties, you can adjust without having to toss out any of the dough. 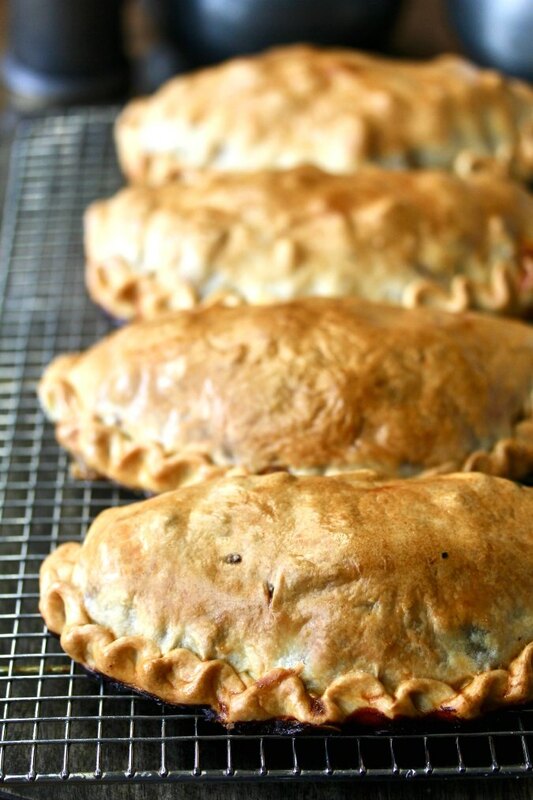 I made 6 traditionally sized pasties with this recipe, which are pretty large. You can also shape them into 12 smaller pasties if you prefer. You can make and bake these in advance and then reheat them in a 375 F degree oven for 10 to 15 minutes. You can also freeze them to reheat later. While not traditional, I added a tablespoon of chopped thyme and a tablespoon of chopped parsley to the meat and vegetable mixture. Instead of the traditional skirt steak, I used flank steak. Let's just say that my house smelled amazing while these were baking, and the resulting hand pies were delicious. I can't wait to experiment with fillings. In the bowl of a stand mixer, whisk together the flour and salt. Add the butter and mix on low with the paddle attachment until the butter is crumbly, 3 to 4 minutes. Scrape down the bowl and switch to the dough hook. Mix on low while slowly pouring in the water. Mix until the dough begins to gather around the dough hook. If you need more water, add it one tablespoon at a time. Increase the mixer speed to low/medium and knead the dough for 2 to 3 minutes. Remove the dough from the bowl and hand knead for about one minute. Using a scale if possible, divide the dough into 6 equal pieces. Wrap each piece in plastic wrap and refrigerate for several hours. Place the potatoes and rutabagas in a large saucepan, cover with water, and bring to a boil. Boil for 2 minutes, and then drain. Set aside to cool. In a large bowl, toss the potatoes, rutabagas, onions, salt, pepper, thyme, and parsley. Add the steak and toss again. Roll out a piece of dough to a 10 inch round. Mound 1/6 of the filling onto the dough, top with a piece of butter, and fold the dough over the filling. Crimp the edges of the dough together and place the pie on the baking sheet. Repeat with the rest of the dough pieces. Preheat the oven to 400 degrees F while the pasties rest at room temperature. When the oven has reached 400 degrees F, brush the pasties with the egg wash. Wait 10 minutes more, and brush the pasties again with the egg wash.
Bake the pasties in the oven with the racks on the upper and lower third of the oven for 20 minutes. Switch the pans and lower the oven temperature to 350 degrees F. Continue to bake the pasties until they are a deep golden color, at least 20 to 30 more minutes. Cool the pies on a wire rack. Serve warm or wrap and refrigerate or freeze to reheat and serve later. This recipe has been adapted from the book Pastry by Nick Malgieri. It's a pretty amazing book. I love pasties and yours look perfect Karen. Thanks Wendy. I hear they are quite popular in the Detroit area. I can't help myself. I'm sure the turnip would have been fine, but... well.... you understand! I went back today and they finally labeled the rutabagas! I love these delicious and filling pasties. It's been years since I've made pasties, and now I want one. I used to make them a lot, but I serve them with a side of gravy for the hubs, so he can 'dip' them. I think it's time to dust off my old recipe, or just copy yours and make some more. Thanks for linking up to First Monday Favorites.